.......Who on earth is going to buy this? Dunhill has come out with the final version of the official National Team suit/outfit...(click on the photo above to go to site, where you can browse around). The final version is grey (not dark blue, as we saw it last spring). 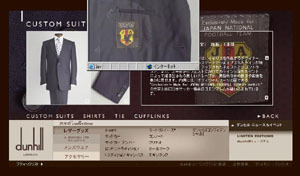 Nothing new, really, since I introduced this before, but I just wanted to point your attention to the Price: a whopping 850 thousand Yen (about $8,000) for the entire ensemble (suit, shirt, tie, cufflinks, and I hear there is also a watch). If you have cash to burn, you may want to hurry...apparently Dunhill is only making 150 of these suits available for "regular folk".